Every sale of the item needs a bill of sale whenever there is monetary transaction or change in ownership. The following Bill of Sales Samples have all the necessary provisions to make the bill of sale a legal document. They have all the mandatory declarations that both the buyer and the seller have to agree to make the deal official. It protects both the parties from future exploitation of any kind. This is a Printable Bill of Sale Samples for selling or purchasing a mobile home. It has a list of items like furniture and electronics goods to write the corresponding price deducted for them. It also has provision to calculate the tax amount and declaration to make the deal go through smoothly. This is a Boat Bill of Sale Samples. 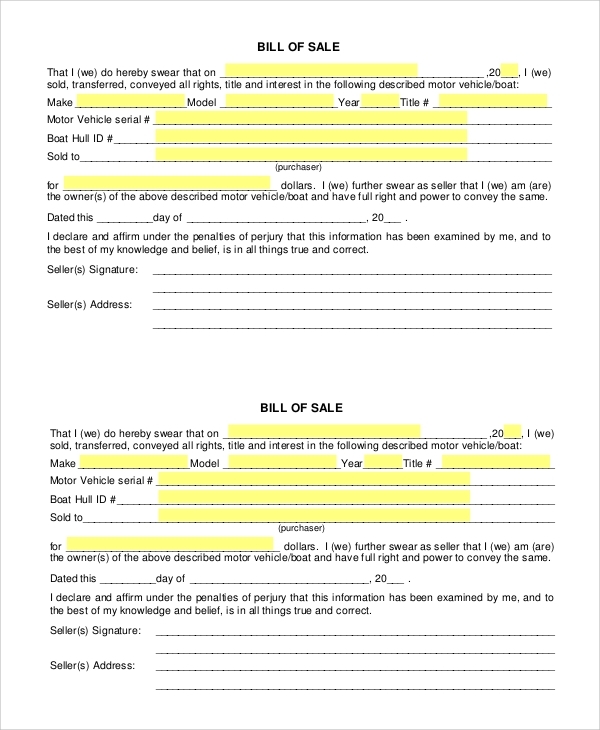 It is in the form of a declaration, having blank fields to fill up, the make of the boat, model number, buyer and seller details, the purchase amount and other necessities so that the buyer becomes the legal owner. It can be sent via email as well. 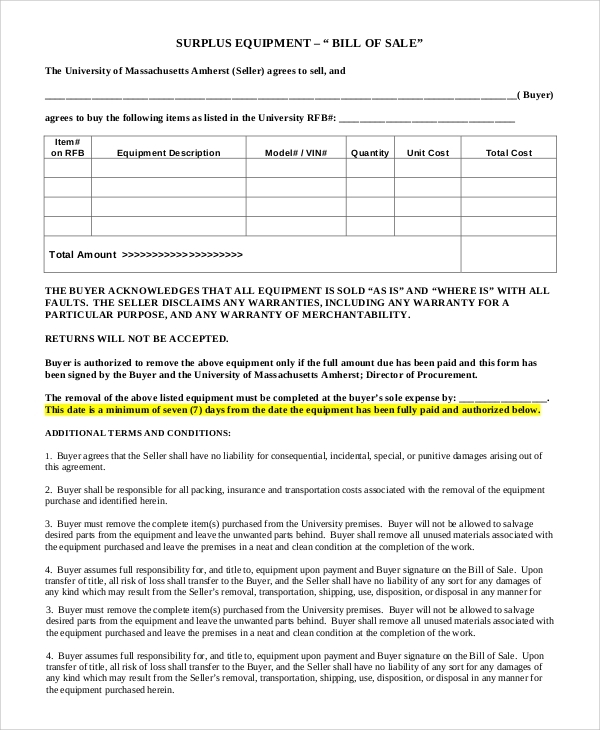 This is a perfect Equipment Bill of Sale Samples and format for a bill of sale of equipment. It has fields to write down item description, model number, quantity and total cost. 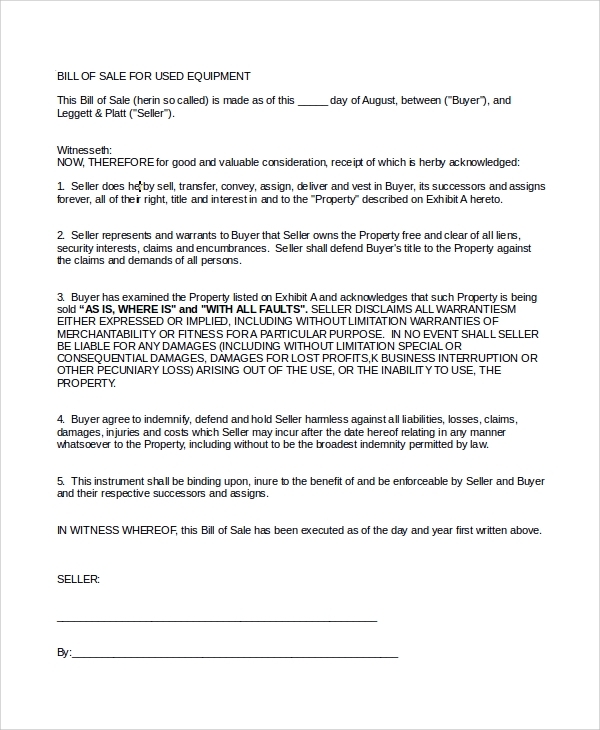 There are a few declarations that the buyer and the seller have to agree to make the purchase official. The above-listed Sample Bill of Sales in PDF are professional in design and contain all the necessary fields and declaration to prevent any party from exploiting the other in future. They are printable invoice samples, and they are fillable digitally before taking the print out. They are legal documents for the purchasing and proving who the real owner of an item is. 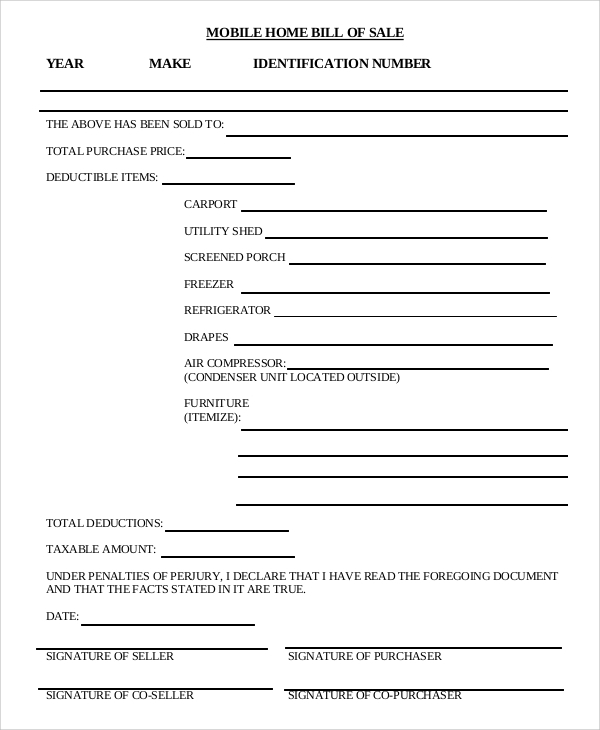 For a bill of sale of used items, there are declarations that no past disputes are present and if any, the seller would be responsible for handling them. 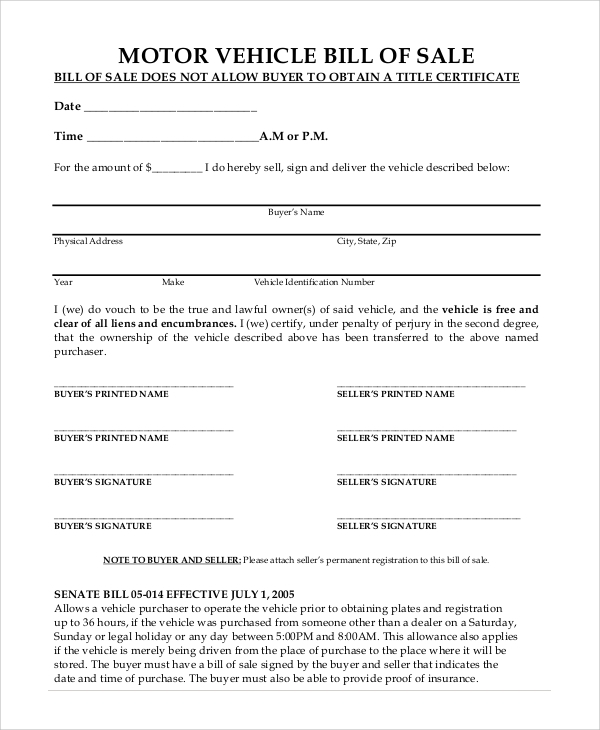 This is a Sample Vehicle Bill of Sale for generating a bill of sale for selling vehicle’s parts. 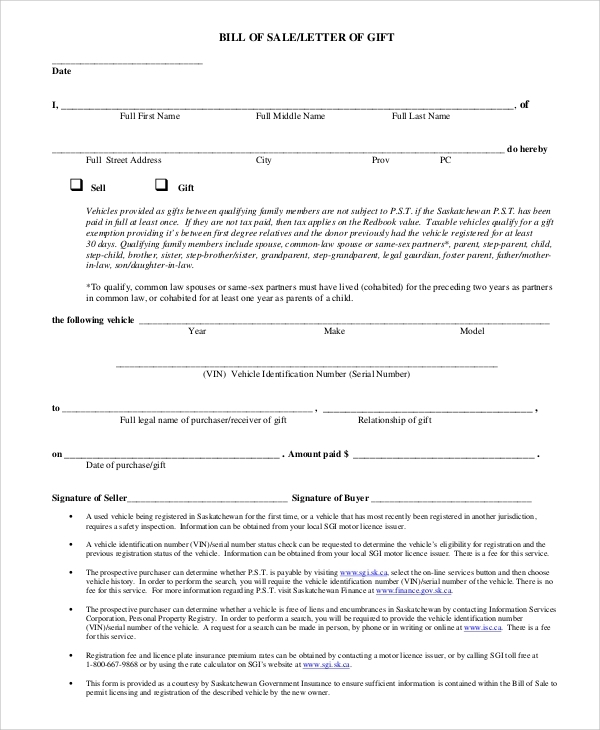 It can be printed after filling up digitally or emailed as well. 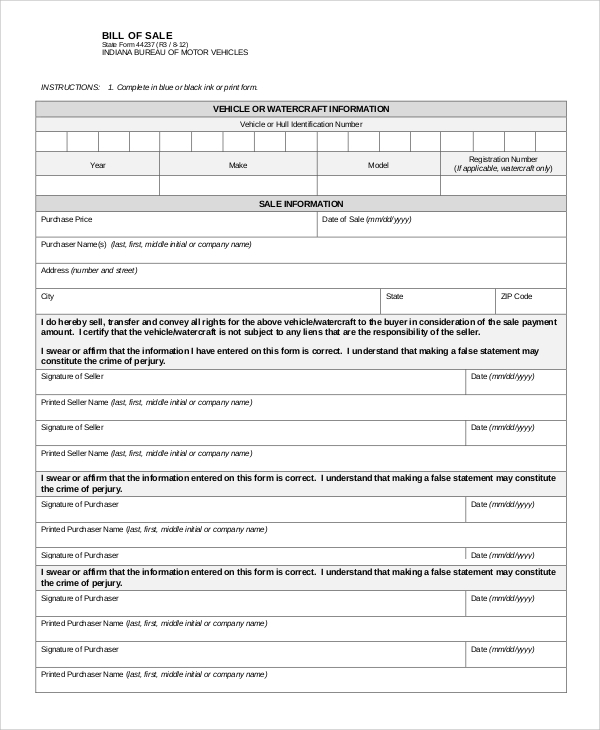 A list of vehicular parts is already present, and one needs to tick mark and fill up the necessary fields. This is a perfect Sample Used Car Bill of Sales. 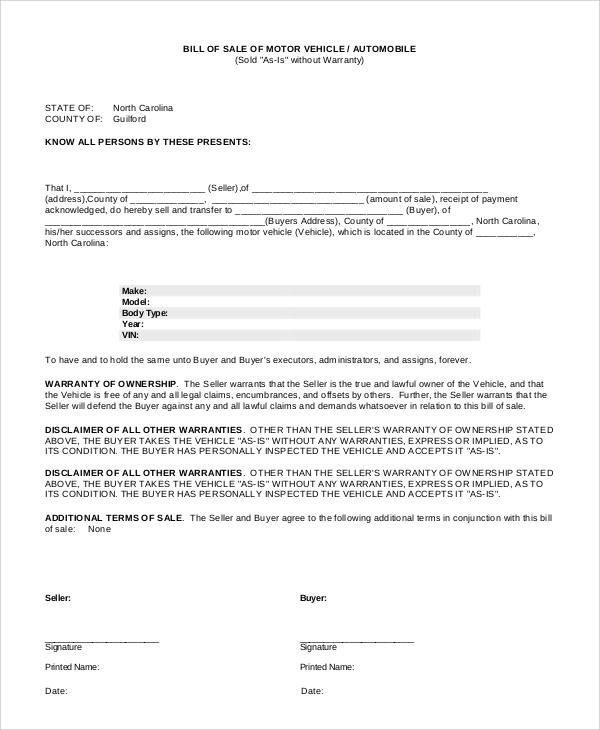 It is in the form of a declaration for the transfer of ownership and making it clear that there are no past disputes. It protects the buyer and the seller from exploitation in future. It also makes the deal official and transparent. The targeted audiences for the Automobile Bill of Sale Samples are from the buyers and the sellers. The seller group represents the businessmen who are selling a product or item. It is mandatory to produce a bill of sale so that the purchase gets official and there is a change of ownership of the product. The buyers must always encourage the seller to produce a professional bill of sale so that it has all the necessary provisions and declarations such as above. The above-listed Bill of Sale Examples has different types catering to different items sold. There are general bills of sale that are applicable for any item. 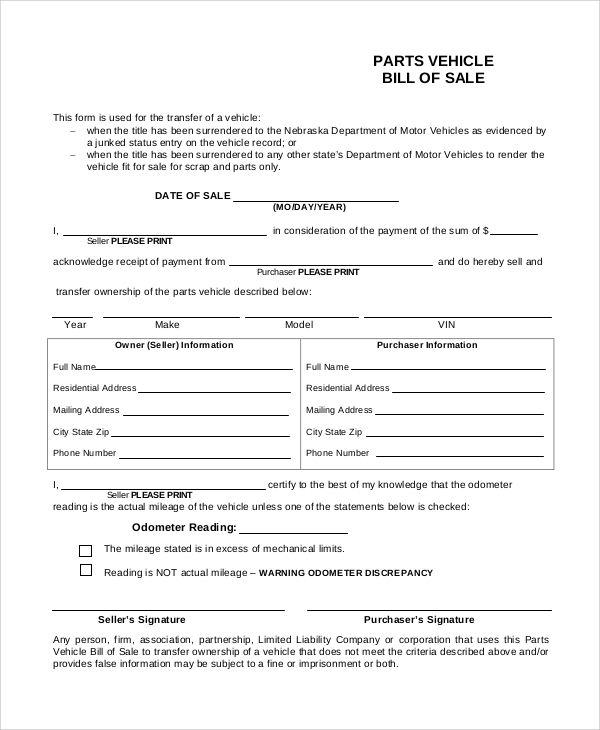 Specifically, there are bills of sale examples for selling a boat, automobiles, homes, vehicle parts and even used vehicles. They are printable and can be filled digitally. They can also be emailed, and in the case of disputes, they are the legal documents that will help the interested party win the case clean.